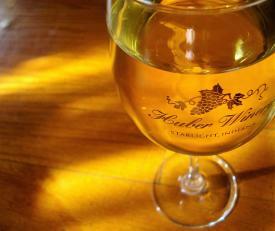 Sample the Spiced Apple Wine from Huber Orchards, Winery and Vineyards. This unique seasonal wine is the Huber family’s interpretation of classic spiced wines from its German heritage. The apple wine is integrated with aromas of cinnamon, clove and nutmeg. Want more adult beverage choices? Visit our Craft Beverages page. The Exchange Pub + Kitchen’s small and creamy goat cheese fritters sit atop bacon aioli and are drizzled with honey. Need we say more? When you take your first bite of this appetizer at The Exchange Pub + Kitchen in New Albany, you’ll be in such a foodie heaven you’ll forget the decadence. Pair the flavors with one of the boutique wines, craft beers, or specialty cocktails selected especially by the Exchange’s staff. Try the sweet soy-glazed chicken wings from the Portage House restaurant in Jeffersonville, where you can dine with views of the Ohio River and the Big Four Bridge. This sweet and salty combination is a flavor bomb served is dusted with sriracha and toasted sesame seeds, with an accompanying bed of fresh dressed greens. 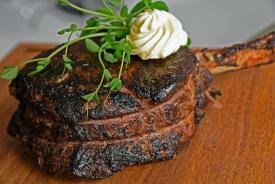 If steak is your prime choice for celebrating, look no further than Brooklyn and the Butcher, known for its “big steaks.” Cuts range from 6-ounce petite filet to 24-ounce porterhouse. Expertly cooked and served in the restored building that was formerly the Windsor Hotel, you’ll relish the restaurant’s atmosphere and service. Want more ideas? Find more riverfront restaurants in Jeffersonville, a mix of ethnic cuisines in downtown New Albany, and more in downtown Jeffersonville. Ever have a flaming dessert? Preparing this dish is no small feat so leave it to the experts at Olive Leaf Bistro. The staff will wheel a special cart to your table and set aflame a dose of banana liqueur to make its bananas Foster Flambé. You’ll watch in awe before you taste the sweet bananas topped with cinnamon, dark rum, chopped walnuts and more. The extravagant dessert originated in New Orleans, which was a major port of entry for bananas shipped from Central and South America. For more dessert ideas, indulge in baked goods from SoIN’s bakeries. Adrienne and Company Bakery Café is one with a sweet reputation. Owner Adrienne Holland has always been an artist, and she discovered cake as her medium. Two locations serve soups, salads, sandwiches – and cake! For two years, she was tapped to make birthday cakes for Louisville native, Muhammad Ali. Want more sweets? Check out our sweets and treats page for more delicious desserts! Our best to you as you enjoy these and other SoIN restaurants with your loved ones during the holidays. When he’s not behind the keyboard writing for SoIN Tourism’s blogs, press release and newsletters as Communications Manager, Russell can be found at local festivals, art galleries or the hottest foodie spots in town. Russell is also a multimedia specialist skilled in audio and video production, photography and social media.